Studies show employee morale is a crucial contributor to employee productivity. At Cee Vee Vending, we recognize our ability to impact the workplace on a daily basis with our innovative micro market in Pittsburgh, PA. Our customizable markets provide large selection, fit in limited space, and offer a hassle-free experience. 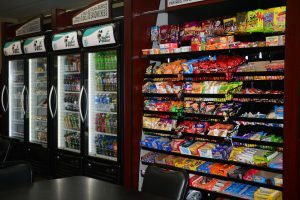 One of the latest workplace innovations, a micro market in Pittsburgh, PA, serves as an automated convenience store, combining the convenience of traditional vending with the food selection of a full-service cafeteria. As a client-oriented Pittsburgh commissary, we design and introduce these unique marketplaces specifically with your employees’ needs and preferences in mind. With nearly endless food options available, your staff is sure to enjoy an impressive selection of freshly prepared lunches, healthy snacks, and drinks that are sure to satisfy any taste. You continually have a full selection, as items in the market are continuously restocked, and less popular items can easily be exchanged for a more desirable product. How Does a Micro Market Work? 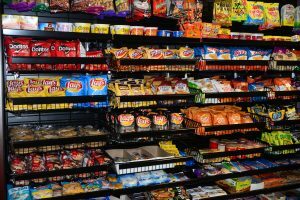 Fitting your business with a micro market from our vendor in Pittsburgh, PA, can be likened to creating a convenience store setup without requiring a cashier behind the counter. Though the aesthetic and choice of products may vary between workplaces, the process of using a self-checkout vending machine market remains the same. Employees select from a wide variety of food, drink, and snack options. After they have made their selection, a user-friendly kiosk will guide them through the checkout process. The kiosk will register each item, display the total, and accept payment. Patrons have the options of paying with their credit or debit card or a refillable market card that we provide. Not only will your employees enjoy eating in the workplace, but they can also easily monitor their purchases and their nutritional intake via their market accounts. Employees can review their accounts from their home computer or smartphone and reference any purchases made, making it easy to track money spent and calories consumed. Call our vendor in Pittsburgh, PA, and see why so many employers are choosing micro markets over conventional vending today. Contact our Pittsburgh commissary for a no-obligation evaluation of your vending potential. Based in Darlington, Pennsylvania, we proudly serve clients throughout the tri-state area.